A closer look at the life of Barrington’s Nicholas P. DiMona II, who gave his life in service to his country. He flew over 47 combat hours during Operation Iraqi Freedom. His awards and decorations include the Army Air Medal, the Army Commendation Medal with one Oak Leaf Cluster, the Army Achievement Medal with two Oak Leaf Clusters, the Army Good Conduct Medal, the National Defense Service Medal with one Oak Leaf Cluster,, the Global War on Terrorism Expeditionary Medal, the Global War on Terrorism Service Medal, the Aviation Badge, the Parachutist Badge and the Army Aviator Badge. Chief Warrant Officer II DiMona, a husband and father, died in a training accident in Georgia in 2004 at age 32. We are forever indebted to him — and to his family — for their sacrifice. Click for an extended obituary. From the Star-Ledger: Names of the 156 service members and two civilians with ties to New Jersey and Bucks County, Pa., who have died in Iraq and Afghanistan. 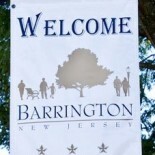 This entry was posted on May 29, 2012 by Barrington Bulletin in Events, Safety and tagged army, memorial, memorial day.